10. You’ll read some really funny stuff from Dave Barry, Martha Bolton, Stephen Colbert, Bill Cosby, Torry Martin, Rhonda Rhea, Will Rogers, Jean A Christmas Story Shepherd, Steven Wright, and more. 9. People will like you more when you write with humor. 8. You’ll be healthier—and so will your readers. 7. Your writing will be 10 percent more memorable with humor. 6. You will learn how to drill away on touchy subjects by using laughing gas. 5. You can impress your snooty friends who think humor writers are intellectual light weights by quoting Plato, Aristotle, Schopenhauer and Freud on their philosophy of humor. 4. You’ll learn how to connect with and comfort your readers through humor. 2. You’ll become rich and famous, lose weight, stop smoking, whiten your teeth, stop global warming, save the whales, realize world peace, and learn the comic technique of hyperbole. 1. You’re guaranteed to earn back the price of this book with your humor writing. 1. Serious studies of humor: Plato to Freud to . . .
3. Is there such a thing as “Christian” humor? Banana peels reduce the appearance of wrinkles, treat headache, soothe skin after bug bites, remove warts, control acne#151;and now cause you to write with humor! Writing with Banana Peels causes outbursts of laughter right from the copyright page on! It’s loaded with hilarious examples and great tips and tricks for writing with humor. From ridding warts to writing funny, you can’t go wrong with banana peels. I was just going to skim the publisher’s review copy of Jim’s book, but ended up reading the whole thing. It was excellent, and I laughed out loud several times. By giving specific examples of well-written humor, he shows his readers how they, too, can make their readers laugh out loud. Dena Dyer, speaker and book author whose work has appeared in such magazines as Women’s World, NickJr., Family, and Writer’s Digest. Funny, funny stuff, but also packed with practical lessons and insight. Jim openly shares comedy secrets used to achieve success in speaking, satire, and assorted silliness. This is not a [book] to be tossed aside lightly. It should be thrown with great force. Dorothy Parker (1893-1967), book reviewer for Esquire. A milk-out-the-nose funny book for both writers and readers. 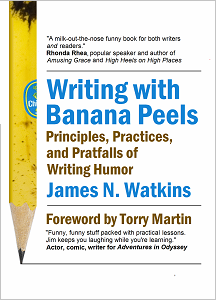 For those for whom writing funny is serious business, James Watkins’ Writing with Banana Peels unpeels the method behind the madness of humor writing. This nationally-known writing coach, author, and speaker ripens us all with his inimitable inspiration, tips, and side-splitting anecdotes.